BACKGROUND AND PURPOSE: Current classification and grading of primary brain tumors has significant limitations. Our aim was to determine whether the relative cerebral volume (rCBV) measurements in gliomas may serve as an adjunct to histopathologic grading, with a hypothesis that rCBV values are more accurate in predicting 1-year survival and recurrence. MATERIALS AND METHODS: Thirty-four patients with gliomas (WHO grade I-IV, 27 astrocytomas, 7 tumors with oligodendroglial components) underwent contrast-enhanced MR rCBV measurements before treatment. The region of interest and the single pixel with the maximum CBV value within the tumors were normalized relative to the contralateral normal tissue (rCBVmean and rCBVmax, respectively). Karnofsky performance score and progression-free survival (PFS) were recorded. Receiver operating characteristic curves and Kaplan-Meier survival analysis were conducted for CBV and histologic grade (WHO grade). RESULTS: Significant correlations were detected only when patients with oligodendrogliomas and oligoastrocytomas were excluded. The rCBVmean and rCBVmax in the astrocytomas were 3.5 ± 2.9 and 3.7 ± 2.7. PFS correlated with rCBV parameters (r = −0.54 to −0.56, P ≤ .009). WHO grade correlated with rCBV values (r = 0.65, P ≤ .0002). rCBVmax >4.2 was found to be a significant cutoff value for recurrence prediction with 77.8% sensitivity and 94.4% specificity (P = .0001). rCBVmax ≤3.8 was a significant predictor for 1-year survival (93.7% sensitivity, 72.7% specificity, P = .0002). The relative risk for shorter PFS was 11.1 times higher for rCBVmax >4.2 (P = .0006) and 6.7 times higher for WHO grade >II (P = .05). The combined CBV−WHO grade classification enhanced the predictive value for recurrence/progression (P < .0001). CONCLUSIONS: rCBV values in astrocytomas but not tumors with oligodendroglial components are predictive for recurrence and 1-year survival and may be more accurate than histopathologic grading. Our intention was to conduct an investigation without the bias introduced by patient classification according to the histopathologic tumor grade. We designed a study with the primary objective of examining the role of MR imaging−derived rCBV values in predicting prognosis in a setting that includes the following: 1) a population of all patients with gliomas, 2) a short-term end point (1-year progression-free survival [PFS] rate) because it seems to be critical for dedifferentiation of astrocytomas from anaplastic astrocytomas or glioblastomas and for survival time in patients with glioblastomas,12 and 3) no patient stratification according to the WHO grade. Our main hypothesis was that rCBV values are a reliable predictor for 1-year PFS in all patients with astrocytomas, better or complementary to the histopathologic grade. Our secondary objectives were the following: 1) to examine if rCBV may be used independently or as an adjunct to histopathology for predicting recurrence and 1-year survival, and 2) to verify the confounding effect of oligodendrogliomas and oligoastrocytomas in CBV measurements and survival effect by excluding them from the initial study population. Approval for this retrospective Health Insurance Portability and Accountability Act−compliant study was obtained from the institutional review board, with a waiver of informed consent. Ninety-three patients with pathologically confirmed gliomas (astrocytomas, oligoastrocytomas, and oligodendrogliomas) who had baseline contrast-enhanced perfusion-weighted MR imaging examinations performed from October 2002 to November 2007 were extracted from our data base. Patients were eligible only if they had no evidence of systemic malignancy, metastatic disease, or immune status compromise. The medical records were assessed for missing or insufficient clinical data, and the baseline MR imaging studies were examined for postprocessing suitability. Patients with any form of treatment before imaging, including corticosteroids, were excluded. All together, 34 patients (17 men and 17 women; mean age, 44.2 ± 15.3 years) with histologically (stereotactic biopsy or surgical resection) confirmed gliomas were included in the study: 27 patients with astrocytomas (7 WHO grade I, 9 WHO grade II, 5 WHO grade III, and 6 WHO grade IV), 4 patients with oligodendrogliomas (3 WHO grade II, 1 WHO grade III), and 3 patients with oligoastrocytomas (2 WHO grade II, 1 WHO grade III). The biopsies were performed in the region of tumor with the highest rCBV, to minimize sampling error. The same neuropathologist reviewed all the samples. In patients with low-grade gliomas (WHO grades I and II), only biopsy was performed without immediate further treatment. The patients with high-grade tumors (WHO grades III and IV) underwent surgical resection, radiation therapy with 60 Gy, and a median of 12 cycles of chemotherapy (range, 3–13 cycles). Chemotherapy consisted of temozolomide in standard doses (5 days out of 28-day cycles) with 150 mg/m2 dose for the first cycle and 200 mg/m2 for subsequent cycles. None of the patients received any other chemotherapeutic agent. The patients were assessed clinically (including KPS) by the neuro-oncologist at our institution with an admission examination and during follow-up every 3 months or on symptom deterioration. Progressive disease was defined as a decline in the neurologic status, worsening KPS, or a clear increase in tumor size on MR imaging (fluid-attenuated inversion recovery [FLAIR], and/or contrast-enhanced T1-weighted images). PFS was retrospectively calculated from the medical records. We determined the number of patients with a PFS of less or more than 12 months (PFS12). The patients underwent conventional MR imaging performed with a 1.5T scanner (Intera; Philips Medical Systems, Best, the Netherlands). Perfusion studies were integrated into the standard clinical MR imaging protocol for evaluation of brain tumors, which included a 3-plane localizer sequence, sagittal T1-weighted images, axial 3D T1-weighted gradient-echo images, axial diffusion-weighted images, axial FLAIR and fast spin-echo T2-weighted sequences, first-pass dynamic susceptibility-weighted contrast-enhanced (DSC) perfusion-weighted images, and postcontrast axial 3D T1-weighted gradient-echo images. Perfusion-weighted DSC-MR imaging was performed with 3D echo-planar principles of echo shifting with a train of observations applied for perfusion studies, with acquisition of images before, during, and after rapid administration of a contrast bolus (40 sections with a section thickness of 5 mm, matrix size of 64 × 64 interpolated to 128 × 128, FOV of 230 mm). The TR of each multishot block was 17 ms, and the acquisition time for each dynamic volume was 1.8 seconds. TE was 17 ms and the flip angle, 7°. Each perfusion series consisted of 50 dynamic images, and the total acquisition time for each perfusion series was 128 seconds during the first pass of a standard-dose (0.1 mmol/kg) bolus of gadolinium contrast agent (Magnevist; Berlex, Montville, NJ) injected at a rate of 5 mL/s with a power injector, followed by administration of a 20-mL bolus of saline at the same injection rate. The calculation of rCBV from the perfusion-weighted MR imaging data was performed off-line by 2 neuroradiologists working in consensus and by using dedicated commercially available postprocessing software. Standard algorithms that have been previously described13 were applied. Review of both conventional MR images and CBV maps including region-of-interest analysis was performed by consensus interpretation of the 2 neuroradiologists blinded to the histologic diagnosis and treatment. First, 1 representative 6 × 6-pixel (corresponding to an area of 10.8 mm2) region of interest on the CBV map, with the lowest possible SD between adjacent pixels, was chosen from areas with the highest visually identifiable CBV values. Additionally, a single-pixel region of interest with the maximum CBV value across all tumor sections was chosen. Care was taken to avoid volume averaging with blood vessels. The values of the 2 regions of interest were recorded for each patient. This methodology has been previously reported to provide high intra- and interobserver reproducibility in CBV measurements.14,15 The CBV values in the corresponding locations at the contralateral uninvolved side were used to obtain rCBV values, computed as the ratio of the mean and maximal CBV of the tumor divided by the mean and maximal CBV of the corresponding contralateral area. The obtained values were labeled as mean and maximum rCBV (rCBVmean and rCBVmax, respectively). All analyses and graphs were performed with MedCalc, Version 9.4.2.0 for Windows (MedCalc Software, Mariakerke, Belgium); the Statistical Package for the Social Sciences, Version 16.0 for Windows (SPSS, Chicago, Ill); and Sigma Stat 3.0 and Sample Power 2.0 (Systat Software, San Jose, Calif). Categoric variables are presented as percentages and continuous variables as mean ± SD. KPS is expressed as median (range). Normality of distribution for all continuous variables was determined by the Kolmogorov-Smirnov test. Comparisons of baseline patient characteristics were performed by using parametric (t test) tests. Pearson ρ correlation coefficient analysis was used to detect any significant correlation in the continuous and interval-scaled variables. Receiver operating characteristic (ROC) curves were constructed by using various cutoff rCBV values to distinguish patients with survival shorter or longer than 1 year. The ROC curves were recalculated with the tumor WHO grade as an input parameter. The areas under the ROC curves, a measure of diagnostic accuracy, were calculated and compared. Kaplan-Meier survival curves were generated for the dichotomized perfusion and histologic grade parameters, which were found to be significant for 1-year survival and recurrent disease in our subjects. 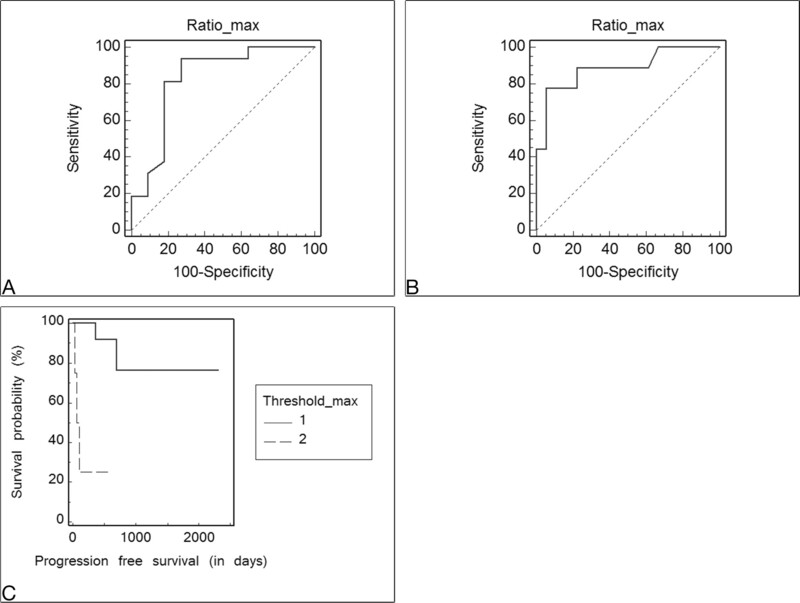 Finally, a combined parameter of histologic grade and perfusion cutoff values was introduced, and the corresponding ROC analysis for 1-year survival and recurrent disease was performed. Results were considered significant at the 2-sided 5% significance level (P < .05). The tumor mean and maximum rCBV values were normally distributed (P = .35 and .29, respectively); there was a normal distribution regarding WHO grading of the tumors as well (P = .13). The demographics of the patient population, histologic grade, KPS, PFS, and rCBVmax values are shown in Table 1. All perfusion-weighted MR examinations could be postprocessed by using the dedicated postprocessing software. An illustrative example of the perfusion-weighted imaging is given in Fig 1 (patient 21). The summary statistics of the rCBVmean and rCBVmax, KPS, and PFS for each subset of tumors (astrocytomas, oligodendrogliomas, and oligoastrocytomas) are listed in Table 2. The differences in the rCBV between oligodendrogliomas and astrocytomas were not statistically significant (P = .20). The clinical parameters were not significantly different between the tumor subgroups (P ≥ .4). Nine patients with astrocytomas and 1 patient with oligodendroglioma experienced tumor recurrence/progression during the first year, confirmed by subsequent surgery and histology in 4 patients (1 oligodendroglioma and 3 astrocytomas). The rCBVmax of the recurrent/progressive astrocytomas was higher (6.03 ± 3.09) than that of the stable astrocytomas (2.31 ± 1.36, P = .006) (Fig 2). Similarly, the difference in rCBVmean was statistically significant between the 2 patient groups (P = .007). Further statistical analysis comparing all patient subgroups was not performed due to the small number of subjects. 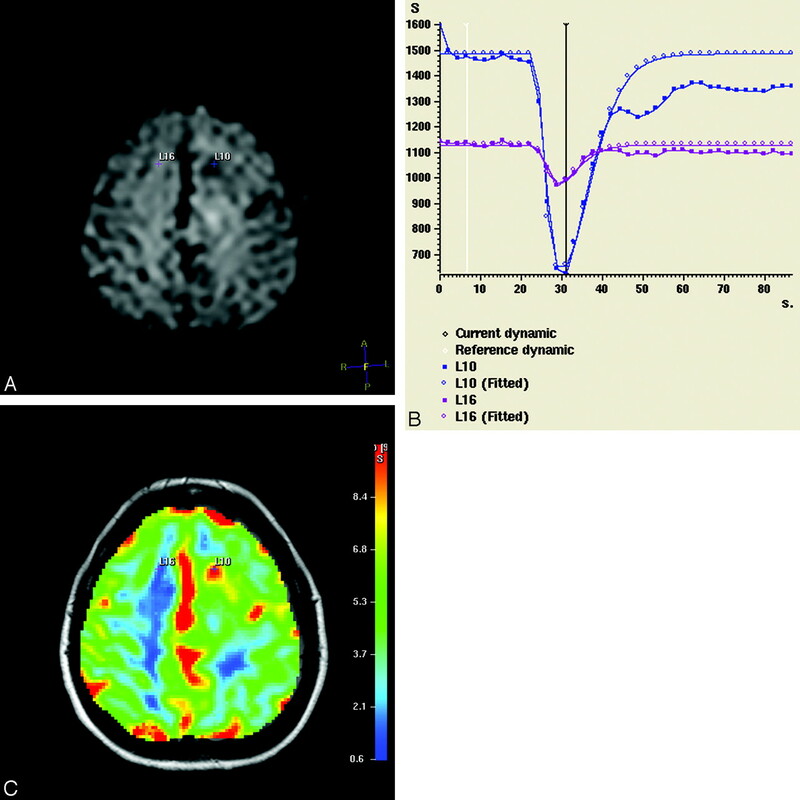 Source dynamic MR image (A), signal intensity time curves (S) (B), and color-coded perfusion map (overlaid on the corresponding FLAIR image) (C) of a male patient with a supratentorial astrocytoma (WHO grade III) in the left hemisphere (patient 21). The tumor pixel with the highest CBV value is represented as a small blue cross (L10). The contralateral corresponding white matter pixel is a purple cross (L16). The 2 pixels have distinct signal intensity curves with markedly deeper signal intensity drop in the tumor pixel (which begins 24 seconds after perfusion-weighted MR imaging initiation). Scatterplot of the PFS and rCBVmax of the astrocytoma population. The plot presents the 2 population subgroups: the recurrent (solid triangles) and the nonrecurrent (open circles) astrocytomas. Note the high perfusion values of the recurrent tumors combined with shorter survival. Correlation coefficients were calculated between the available interval and continuous variables in all patients. An initial validation of our CBV measurements showed no statistically significant correlations between WHO grade and PFS (r = 0.15, P = .4), KPS (r = −0.1, P = .55), rCBVmean (r = 0.14, P = .4), or rCBVmax (r = 0.17, P = .32) in the mixed population. After removing the patients with oligodendrogliomas and oligoastrocytomas, we found significant correlation coefficients between PFS and rCBVmean (r = −0.43, P = .01), PFS and rCBVmax (r = −0.47, P = .0005), KPS and rCBVmean (r = −0.37, P = .03), KPS and rCBVmax (r = −0.38, P = .02), WHO grade and rCBVmean (r = 0.65, P = .0002), WHO grade and rCBVmax (r = 0.65, P = .0001), and WHO grade and PFS (r = −0.43, P = .02). The mixed population was thought to be the reason for this discrepancy; thus, further analysis focused on the 27 patients with astrocytomas. Most interesting, PFS correlated with KPS (r = 0.4, P = .04), whereas histologic grade was not significantly correlated with the KPS (r = −0.1, P = .12) in astrocytomas. The results of ROC analysis of mean and maximum CBV and rCBV values as predictors of PFS12 were not statistically significant when the oligodendrogliomas and oligoastrocytomas (separately and together) were included (P > .15). For astrocytomas only, the CBVmax threshold of >4.2 was found to be a significant cutoff value for recurrence/progression prediction with 77.8% sensitivity and 94.4% specificity (P = .0001), whereas the cutoff value of ≤3.8 was a significant predictor for 1-year survival (93.7% sensitivity, 72.7% specificity, P = .0002). A significant difference in PFS was also found between the patients with rCBVmax ≤4.2 (761 ± 451 days) and the patients with rCBVmax >4.2 (135 ± 127 days) (P = .002). The patients with rCBVmax ≤4.2 had higher 1-year survival (P = .0006) (Fig 3), whereas the relative risk for recurrence was 11.1 times higher in patients with rCBVmax >4.2 (P = .0007). 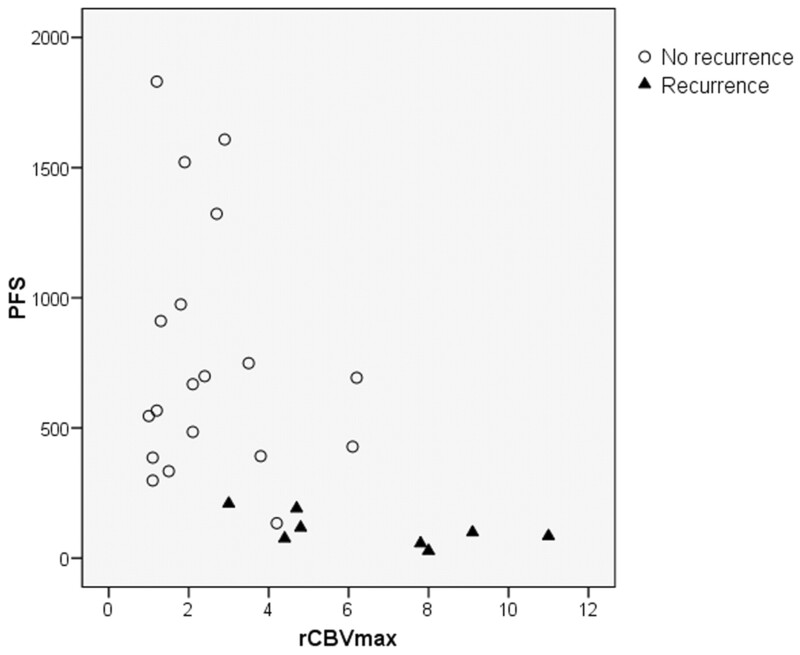 The ROC curves analyzing the sensitivity and specificity of rCBVmax values in astrocytomas for 1-year survival (A) and recurrence (B) show the optimal threshold value as ≤3.8 (sensitivity, 93.7% [95% confidence interval (CI), 69.7–99%]; specificity, 72.7% [95% CI, 39.1–93.7%], P = .0002) for 1-year survival and as >4.2 (sensitivity, 77.8% [95% CI, 40–96.5%]; specificity, 94.4% [72.6–99.1%], P = .0001) for recurrence. C, Kaplan-Meier curve of PFS probability (hazard ratio [HR] = 0.09, P = .0007). The thresholdmax represents the rCBVmax cutoff value, in which 1 corresponds to rCBVmax ≤4.2. ROC analysis of the WHO grading system as a predictor of PFS12 showed that WHO grade >2 demonstrated significant (P = .0001) sensitivity (88.9%) and specificity (72.2%) in predicting recurrence (Fig 4). 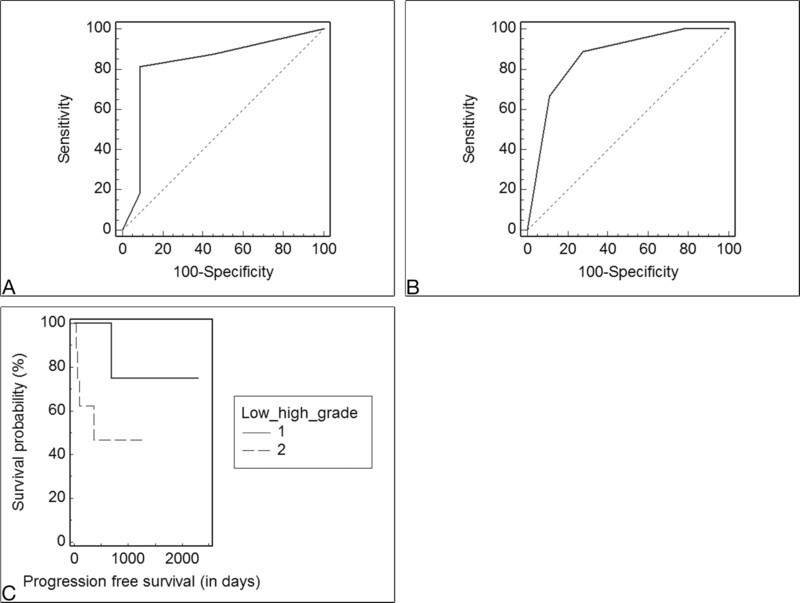 The predictability of 1-year survival based on the histopathologic grading was also statistically significant (sensitivity, 81.2%; specificity, 90.9%; P = .0002). The patients with WHO grades I and II (14 patients) had a higher PFS (782 ± 381 days) compared with the PFS in patients with WHO grades III and IV (13 patients) (354 ± 328 days, P = .02). The Kaplan-Meier analysis revealed a 6.7 times increased relative risk for a shorter PFS in patients with WHO grades III and IV compared with WHO grades I and II (P = .05). The rCBVmean in patients with WHO grades I and II (1.87 ± 1.09) was significantly lower than the rCBVmean in patients with WHO grades III and IV (5.23 ± 3.17, P = .001). Low-grade astrocytomas had a significantly lower rCBVmax (1.9 ± 0.9) than the high-grade astrocytomas (5.32 ± 2.9, P = .0012). A and B, The ROC curves analyzing the sensitivity and specificity of the WHO grading system (I-IV) for the 1-year survival (A) and recurrence (B) show the optimal threshold value as <2 (WHO grade II) (sensitivity, 81.2% [95% confidence interval (CI), 54.3–95.7%]; specificity, 90.9% [95% CI, 58.7–98.5%], P = .0002) for 1-year survival and as >2 (sensitivity, 88.9% [95% CI, 51.7–98.2%]; specificity, 72.2% [95% CI, 46.5–90.2%], P = .0001) for recurrence. C, Kaplan-Meier curve of PFS probability is based on stratification according to the WHO grade (1 = low grade [WHO I-II], 2 = high grade [WHO III and IV)]; HR = 0.15, P = .05). The next step was to examine whether the prediction rates for 1-year survival and tumor recurrence could be improved by combining the WHO grade and rCBVmax criteria. We defined 4 groups for the patients with astrocytomas: Group 1 had tumors WHO grades I and II and rCBVmax ≤4.2; group 2, WHO grades I and II and rCBVmax >4.2; group 3, WHO grades III and IV and rCBVmax ≤4.2; and group 4, WHO grades III and IV and rCBVmax >4.2. Fourteen patients were placed in group 1, there were no patients in group 2, group 3 had 5 patients, and 8 patients were assigned to group 4. The results showed that the joint histopathologic CBV classification provided statistically significant results for both 1-year survival and recurrence (dichotomizing criterion ≤1: sensitivity, 81.3%; specificity, 90.9%; P = .0001; dichotomizing criterion >3: sensitivity, 77.8%; specificity, 94.4%; P = .0001, respectively). With this classification system, the patients in groups 1 and 3 had a significantly higher mean PFS (761 days) compared with the patients in group 4 (135 days) (P = .0001). The patients with high-grade astrocytomas and rCBVmax >4.2 had 20 times increased relative risk for a shorter PFS compared with the patients with astrocytomas and low rCBV, regardless of the grade (P < .0001). The rCBVmax in patients stratified in groups 1 and 3 (2.11 ± 0.99) was significantly lower than the rCBVmax in patients in group 4 (6.98 ± 2.38, P = .0005). The management of gliomas has been widely based on the WHO histopathologic classification and grading system following a stereotactic biopsy or surgery. However, the clinical management of the low-grade gliomas (WHO I and II) depends on the clinical behavior of these tumors and may vary from a “wait-and-see” policy to a prompt surgical treatment,16 whereas high-grade (WHO III and IV) gliomas typically require a resection (subtotal or near-total) and adjuvant radiochemotherapy in WHO grade IV tumors. This variable management of low-grade gliomas along with the WHO grading pitfalls indicates a need for another classification system as an adjunct or, potentially, replacement for histopathology in guiding treatment decisions. An outcome-based classification would be of greater value, allowing use of potential prognostic factors to tailor the individual therapy regimen.10,17 It was recently shown that rCBV may be able to distinguish the stable from the rapidly progressing gliomas among patients with the same histopathologic grade (WHO grade II).10 Considering the results from 2 previous studies,7,10 we conducted an investigation that included all patients with primary brain tumors, with the histologic diagnosis of glioma as the only requirement. Recurrence and 1-year survival (the latter has not received appropriate attention in previous studies), which are important parts of the treatment outcome analysis, were used as end points in this study. An initial validation of our CBV measurements showed high correlation coefficients with the WHO grade, which may be attributed to the vascular proliferation index, measured directly by the neuropathologist and indirectly by the neuroradiologist. The absence of correlation between the tumor grade and the KPS may be anchored in the inclusion of patients with KPS ≤60, which is believed to be a relative exclusion criterion for glioma studies because these patients have a median survival of only approximately 2 months.20 Of note, the correlation between histopathologic grade and PFS was weaker and less significant than the correlations of PFS with rCBVmean and rCBVmax. These results support our hypothesis that MR perfusion parameters may be comparable or even better than histopathologic grading as survival predictors and are in agreement with a previous study21 that found significant correlation between perfusion-weighted MR imaging measurements and outcomes (P < .01). The optimal rCBVmax threshold for discrimination of astrocytomas with a high probability of recurrence was >4.2, whereas the rCBVmax ≤3.8 predicted 1-year survival. These thresholds seem higher than those reported by Lev et al (1.5)7 and Law et al (1.75).8 This discrepancy may be explained by certain methodologic differences: 1). The method of deriving the maximum rCBV was not based on a single-pixel measurement but on averaging three 4 × 4-pixel values7 or on a region of interest with 3.6-mm radius measurements8; 2) 1 study7 has arbitrarily adopted the 1.5 cutoff value in a mixed population of astrocytomas and oligodendrogliomas, whereas the other8 included only a mixed population of low-grade gliomas and was based on a previously reported threshold,22 which was found to minimize the so-called C2 error (the percentage of observed data points misclassified); 3) these studies tried to find cutoff values to classify gliomas retrospectively according to their WHO grade, introducing, in this way, a methodologic bias.7,22 If this was the main objective of the present work, ROC analysis of our results having histologic grade as the classification variable would yield 100% sensitivity and 50% specificity for a rCBVmax cutoff of 1.7 (P = .009), similar to the results reported by Law et al (95% sensitivity, 57.5% specificity).22 However, this would not lead to significant sensitivity and specificity rates for prediction of 1-year survival and recurrence (P ≥ .2). A stronger prognostic value of rCBVmax compared with rCBVmean in our study is not surprising because a single-voxel measurement is more likely to detect a small area with the highest angiogenesis (presumably reflecting the highest malignant potential), whereas a larger region of interest inevitably includes and averages a more heterogeneous population of tumor cells. The Kaplan-Meier survival analysis in patients with astrocytomas revealed a significantly increased relative risk for a shorter PFS with a high rCBVmax, higher than that with a high WHO grade. The ROC curve analysis in the group of astrocytomas corroborates these results and our hypothesis that CBV measurements may be used as an adjunct to histopathology and even as an independent prognostic factor. The latter was also demonstrated by Law et al10,11 in a mixed population of low-grade gliomas, in which the low-grade oligodendrogliomas had predominantly low perfusion values resembling astrocytomas (in contrast to our study). Our study supports the extrapolation of the independent role of rCBV measurements for 1-year survival prediction in all patients with astrocytoma. The equal statistical significance of the binary CBV-based classification in low- and high-perfusion astrocytomas compared with the WHO-based classification is anchored in the relatively high frequency of astrocytomas that are either low grade with high rCBV values or high grade with low rCBV values. The clinical existence of such cases is evident23 and may be attributed to the tumor vascular heterogeneity and the shortcomings of histologic sampling.5 Although there were no cases of histologically low-grade astrocytomas with high rCBV values in our study, we did have 5 cases of high-grade but low-perfusion tumors; in 2 of them, the histologic diagnosis was made by biopsy. These 2 patients were initially treated with chemotherapy and subsequent partial resection, and their PFS was 790 and 1521 days. Finally, the combination of rCBV values and histologic grading appears to provide the strongest predictive value for recurrence/progression (P < .0001). It seems that the optimal role of perfusion-weighted MR imaging for evaluation of gliomas would be threefold: 1) In patients with imaging and clinical presentation of a low-grade tumor, low rCBV values are reassuring and may exclude the need for biopsy because the patients would be followed without any therapeutic intervention; 2) in patients with histologically confirmed high-grade gliomas, low rCBV values may indicate a relatively favorable prognosis; and 3) in patients with imaging features of low-grade tumors, high rCBV values suggest a need for a more aggressive approach with biopsy and treatment and/or closer interval MR imaging. The reference standard for treatment planning and predicting outcome in patients with gliomas has been histopathologic grading. Our results demonstrate that grading based on rCBVmax perfusion-weighted MR imaging may be a better predictor of 1-year survival and may be used as a valuable adjunct to histopathology in patients with astrocytomas. Accepted after revision November 17, 2008. You are going to email the following Cerebral Blood Volume Measurements by Perfusion-Weighted MR Imaging in Gliomas: Ready for Prime Time in Predicting Short-Term Outcome and Recurrent Disease?